Persepolis is the better-known work and deserves all its praise (and I also highly recommend it), but I want to spotlight one of Marjane Satrapi’s other works that is just as moving. Chicken with Plums is a graphic novel about the last eights days of her great uncle’s life in November 1958. Nasser Ali Khan was a well known musician in Iran but when his instrument (a tar, a lute or guitar-like instrument) gets damaged, he’s unable to find a replacement good enough and falls into a bed-ridden depression. The story is tragic but there are moments of humor and hope that prevent it from feeling like a dirge. Anyone who feels a connection or longs for a connection to creativity of some kind should get something out of this. Ali Khan essentially loses his muse, and the reveal of the whys and wherefores behind that loss is heartbreaking. In other words, yes I cried. Satrapi once again masterfully depicts Iranian culture of the time, and in that respect it serves as a great companion to Persepolis. For sheltered Americans like myself, these kinds of glimpses into countries not are own are so valuable. From simply watching or reading the news, reading about names and events can start to have a dehumanizing effect. Things just seem to happen on a broader scale, all defined in simplistic terms of “good” and “bad”. This country did something. Oh, well is that good or bad? Zooming in, you discover that the Country didn’t do anything. Many human beings within the country are doing lots of things. And a lot of those things might be really familiar to a lot of the things that I do. It doesn’t mean there aren’t differences, it just means they are human differences. Families and friends, and the love and heartache between them, exist everywhere. 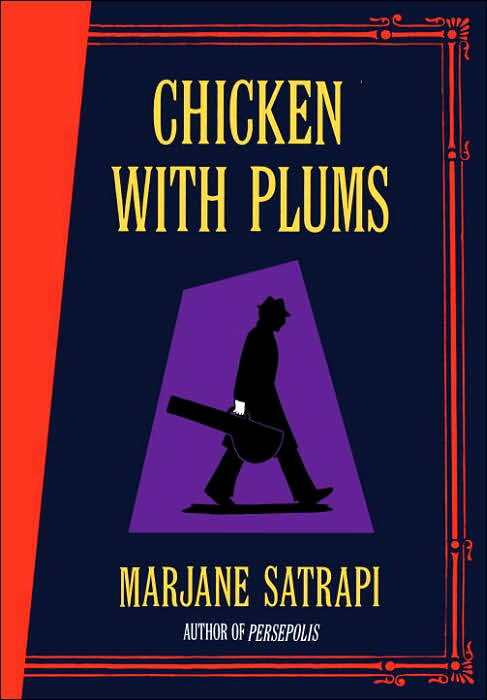 As with Persepolis, Satrapi has turned Chicken with Plums into a feature film directed by herself and comics artist/filmmaker Vincent Paronnaud. Unlike Persepolis, the movie is live action, although some animation is used as visual effects. The French-language Proulet aux Prunes replaces the tar with a violin but otherwise appears very faithful to Satrapi’s graphic novel. The movie debuted last month at the 68th Venice Film Festival and will screen throughout France next week. No plans yet for an English subtitled version but I’m sure it’s just a matter of time. Here’s the trailer so you can practice your French. It looks good.